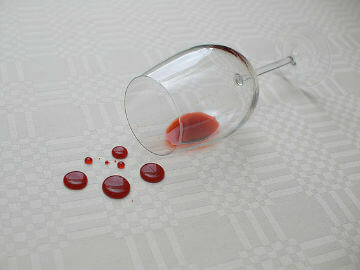 Don’t let stains ruin your life. Get your carpet protected now. One of the biggest things to hit the textile cleaning industry has been the wide spread acceptance of fabric protector or as we know it either 3M Scotchgard or DuPont’s version Teflon. Since 1985 carpet has left the factory with a healthy dose of it applied to the carpet. You are probably asking yourself “well then why do I need to have you reapply it if it’s comes with it?” You can provide the answer to that question quite simply on your own with out any high pressure sales pitch. Simply drizzle some water first in the hall way or doorway of a busy room. Now if your carpet is less then three years old that water will just beed up and you can easily wipe it up with no issue what so ever…. Now if your carpet is more then about 3 years old that water will sink right into the carpet fibers with no hesitation. Now if your carpet is a few years old how can you in the privacy of your own home duplicate this feet? It’s quite simple, go to a very low or even no traffic area, the best choice is usually under a couch or bed that’s been in that same place for many years. Now under that couch or bed do the same water teat and see how the water beads up. Your next question is probably: where did the factory applied stuff go? Simply put it wore off from foot traffic just the same as if you have a stained or painted deck, where you walk all the time the stain or paint wears off much quicker. And just like with your deck you can simply apply new carpet protector and regain that level of protection again. It’s not as expensive as you think either.